Let there be peas! 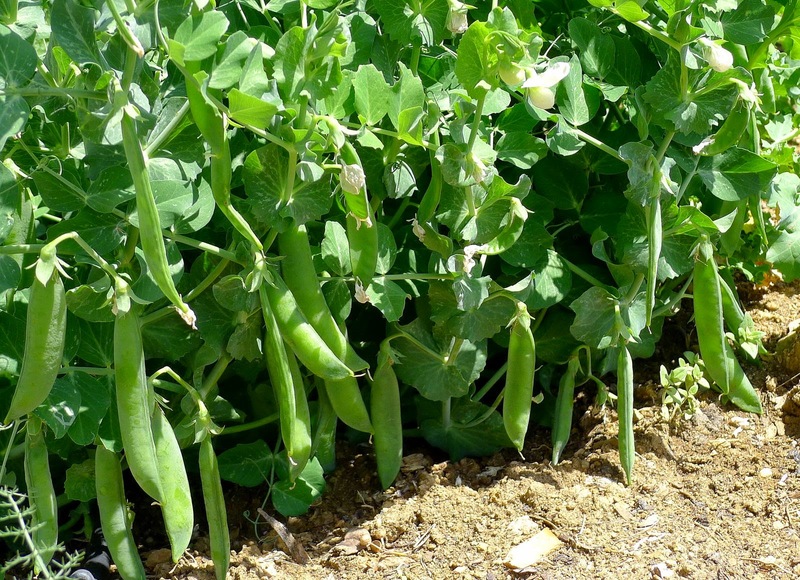 Garden peas, almost ready for picking. And, glory be, so it has come to pass. Sweet garden peas. At first, just a handful at a time. My grandson Leo shells them and eats them raw. Within a few days, I have enough for a couple of servings, quickly blanched and spritzed with a little olive oil. Now, I’m picking a small basketful every other day. Sure, I could freeze them. But they are so delicate and sweet when freshly picked that I’m trying to use them fresh while they last. Fresh-picked peas are so sweet. Peas are really easy to shell. On the convex curved side, get the side of your thumb nail into the pod and just sort of unzip the shell. Shelling peas are in local markets now too. I bought a handful for comparison. They are bigger than my garden peas (in the photo at right, the market peas are on the right) and starchy rather than sweet. They would be fine for slow-cooked dishes or for soup. Here are some of the ways I prepared peas this week. 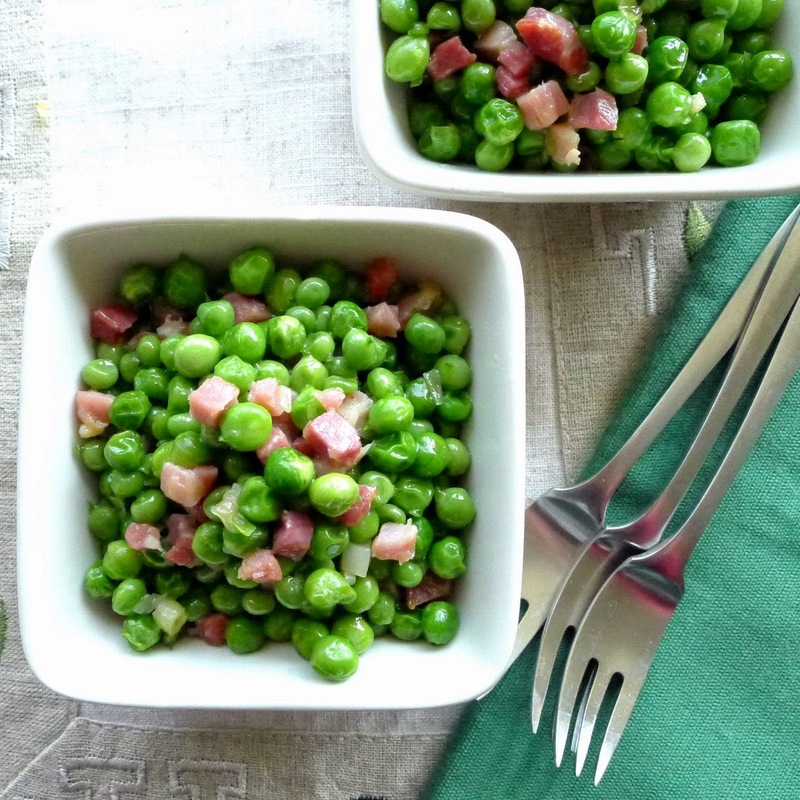 Peas sautéed with serrano ham. 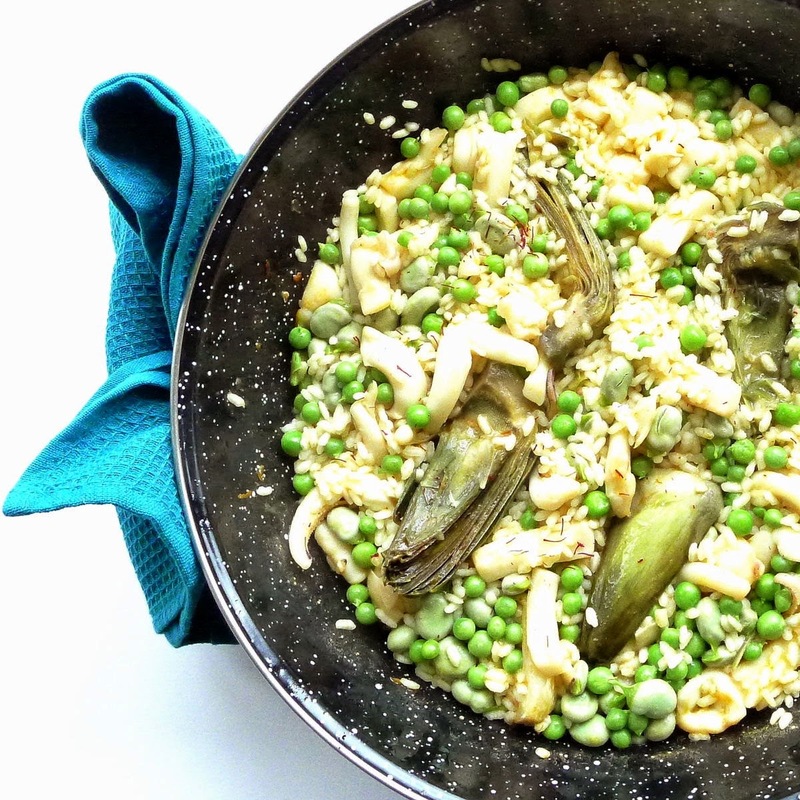 Rice with cuttlefish, peas, fava beans and artichokes. 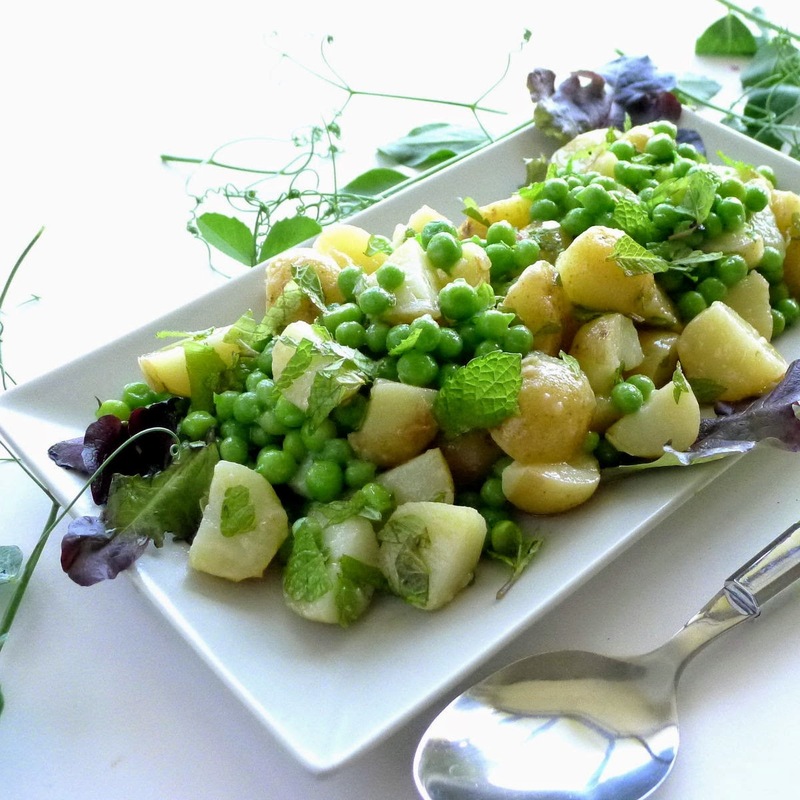 Salad with peas, potatoes and fresh mint. The wildflowers bloom right next to the pea patch. 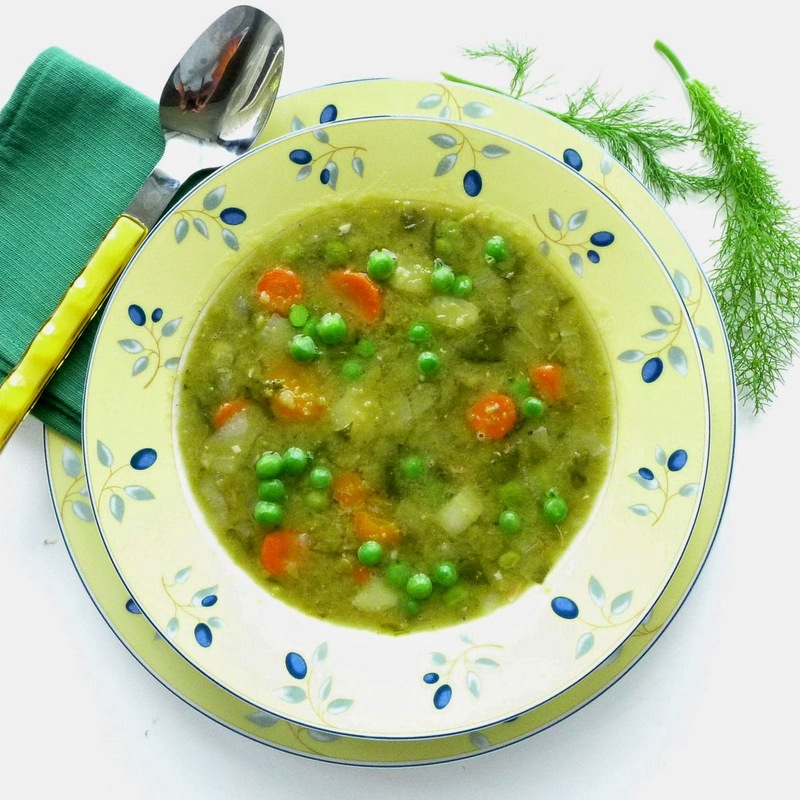 For a rainy spring day--split-pea soup with carrots, chard and fresh peas. 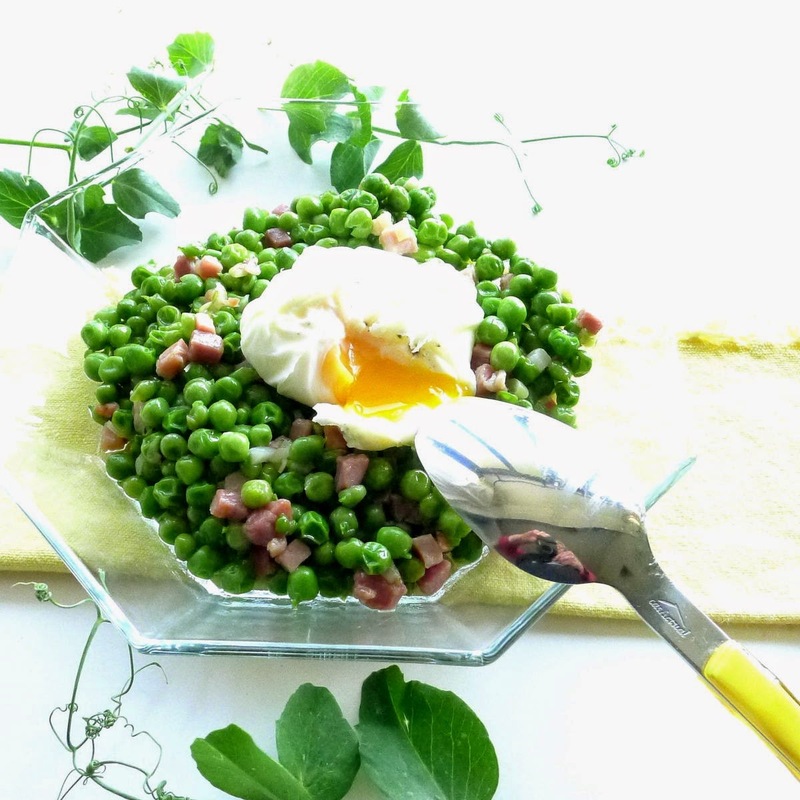 With poached egg, peas are a main dish. This is the sort of dish that might be served as a starter or tapa in Spain. Garnish with a little chopped cooked egg, if desired. Or, top a serving with a poached egg and serve it as a luncheon or supper dish. For this recipe, I used garden peas that had been blanched, so they only needed to reheat in the sauté pan. 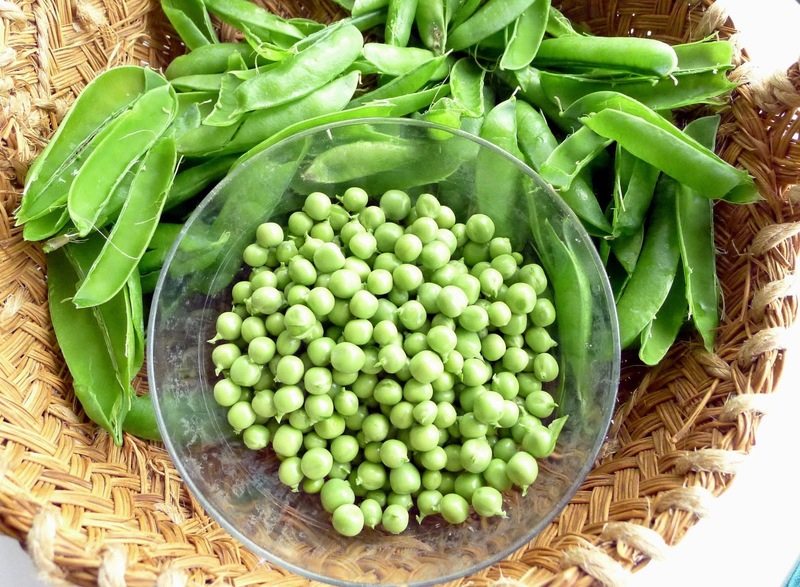 If using frozen or raw peas, let them cook for 5 minutes. 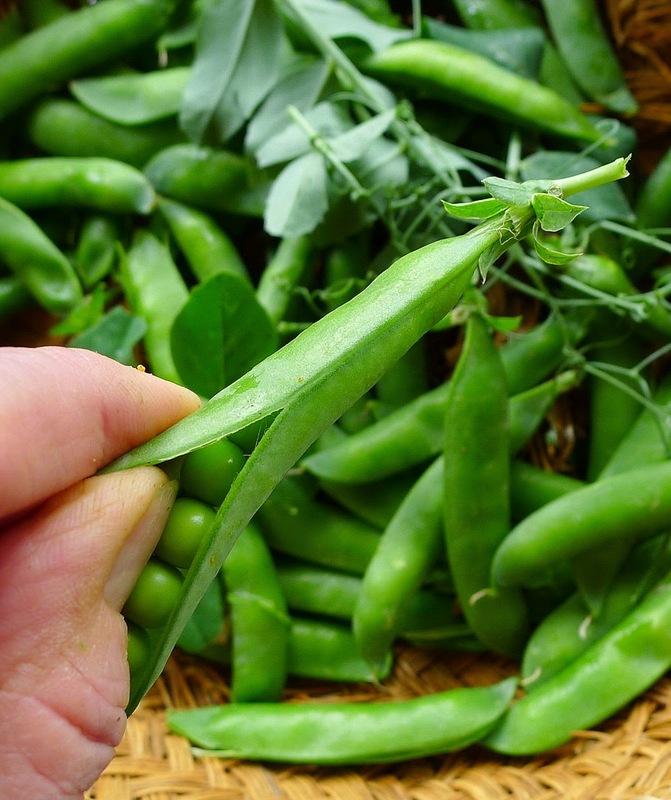 You will need about 1 ¼ pounds of peas in their pods to make 1 cup shelled peas. Serves 6 as a starter or side; 3 as a supper dish. Heat the oil in a medium skillet and add the onions and garlic, if using. Sauté very gently until onion is almost melted, about 6 minutes. Add the ham and sauté 2 minutes. Add the Sherry, if using, and cook until liquid has evaporated and ham is sizzling in the oil again. Add the peas to the skillet. Sauté, stirring, until peas are cooked, about 5 minutes for fresh or frozen peas. Season with salt to taste and pepper. Serve hot or room temperature. Garnish, if desired, with chopped hard-cooked egg. Or, top each serving with a poached egg. Cool way to poach eggs. Line a small bowl with plastic wrap. Add a little olive oil. Break an egg into the bowl. Sprinkle with salt and pepper. Twist the plastic to close tightly and tie. 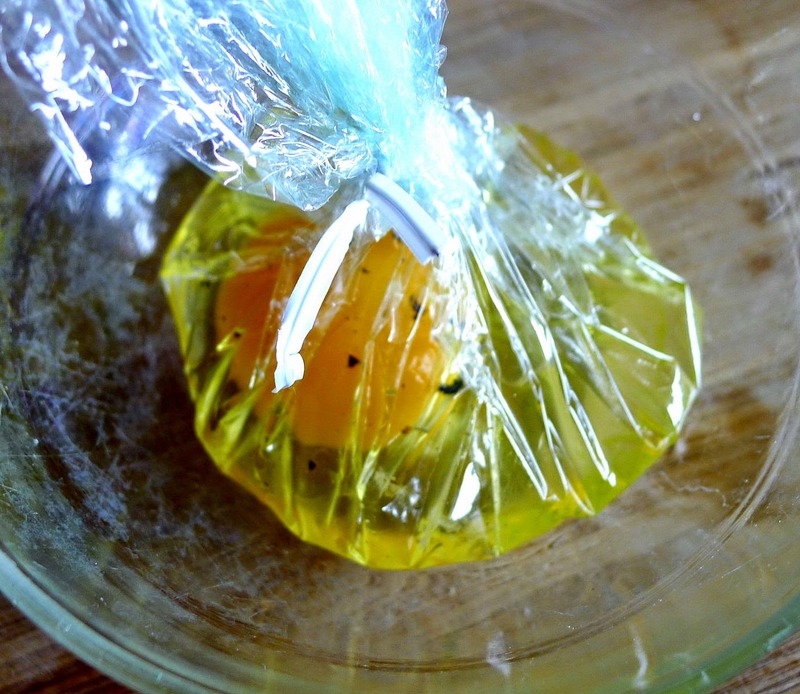 Submerge the egg packets in boiling water. Reduce heat to a simmer. Poach eggs 3 to 4 minutes. Remove the packets. Untie the plastic and carefully roll the eggs onto the plate of peas and ham. A simple paella: rice, cuttlefish, vegetables. 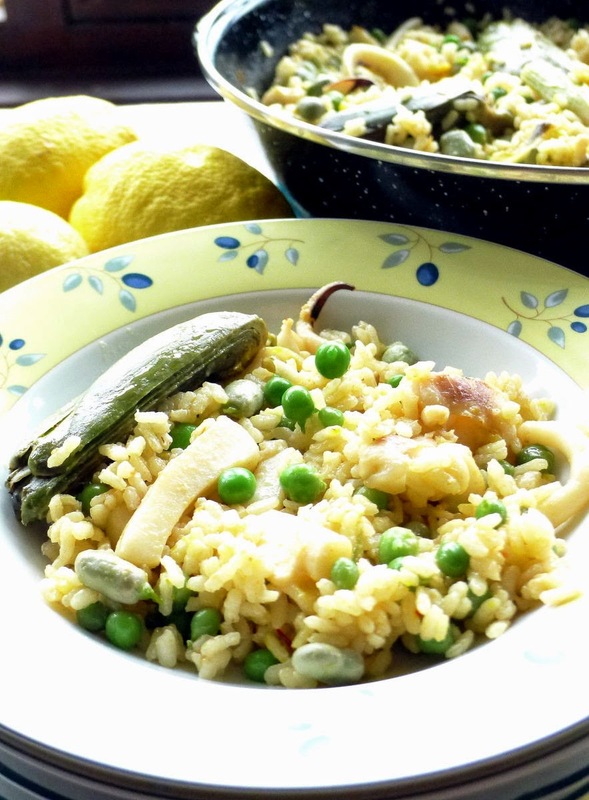 This Alicante dish is a simplified paella, containing only cuttlefish (use squid, if preferred) and vegetables. Use fresh or frozen small fava beans and peas. If using fresh artichoke, cut it in quarters and add immediately to the pan—no need to soak in lemon-water. Instead of a whole head of garlic, I used a stem of immature garlic from the garden. Heat the oil in a paella pan or deep skillet. Fry the whole head of garlic. Add the pieces of cuttlefish and sauté for a few minutes. Add the grated tomato pulp. Strip off and discard outer leaves from the artichoke. With a serrated knife, cut the artichoke into quarters. Use the tip of a small knife to nip out the fuzzy choke. Add the quartered artichoke to the pan. Add the wine and cook until wine has evaporated. Place the crushed saffron in a small bowl and add the hot water. Allow to infuse for 5 minutes. Add the rice to the pan and allow to sauté a few minutes. Add the water, salt, fava beans and the saffron-infused water. Bring to a boil, then reduce heat to medium and allow rice to bubble for 10 minutes. Add the peas. Place the head of garlic in the center of the rice. Reduce heat and cook until liquid is absorbed and rice is nearly tender, about 8 minutes. Don’t stir the rice. Remove the pan from the heat and allow to set for 10 minutes. Serve with lemon slices. Mint leaves lend a fresh springtime flavor. Mint gives this salad a fresh, springtime flavor. 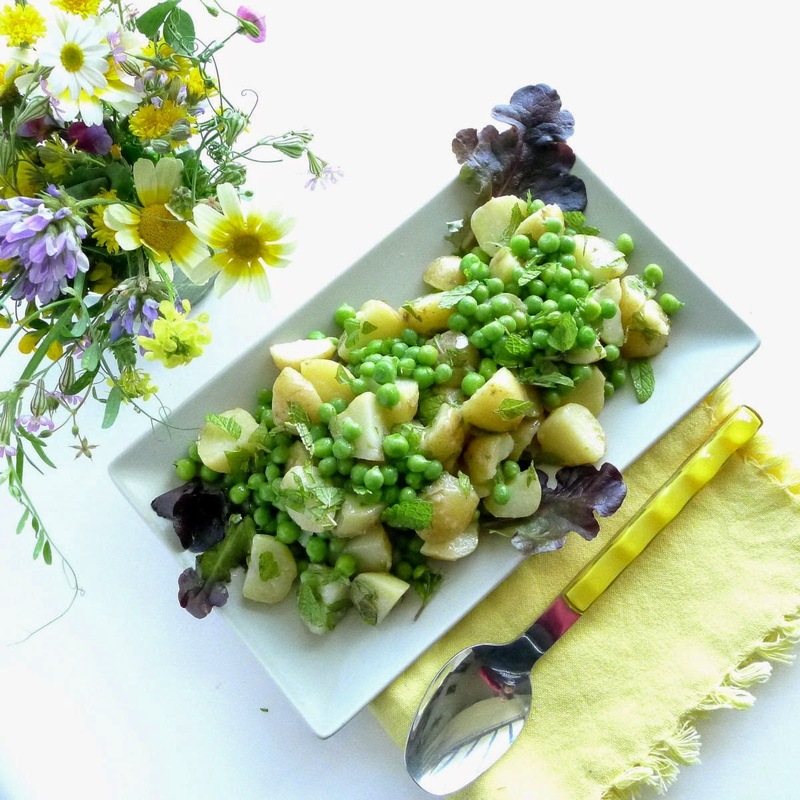 Stir the cooked peas into the potatoes and dressing immediately before serving, so the vinegar dressing does not leach the green color from the peas. Cook the potatoes in boiling salted water to cover until they are tender. Drain and let them cool. Cut the potatoes in quarters and place in a bowl. Combine the mustard and vinegar. Whisk in the oil until dressing is emulsified. Season with salt. Pour over the potatoes. Let them marinate at least 1 hour or, refrigerated, overnight. 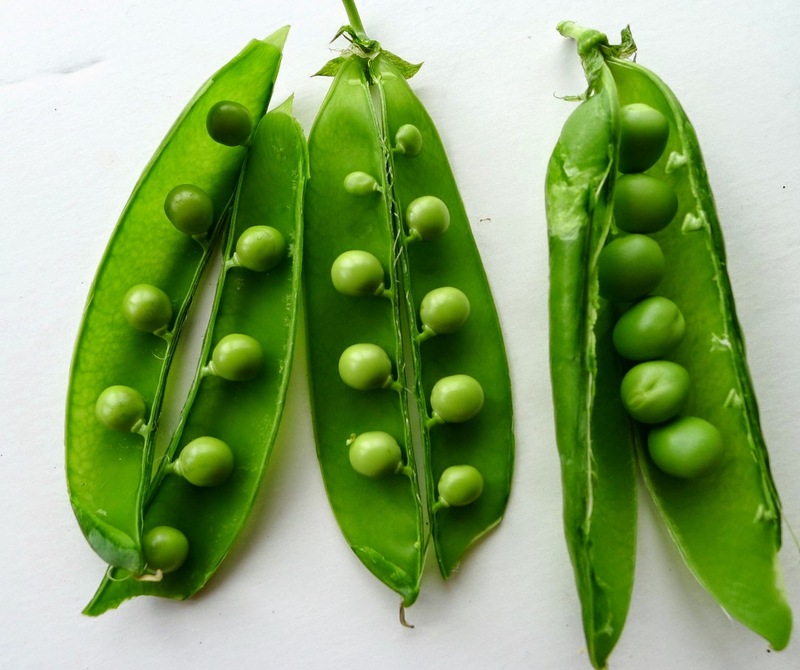 Cook the peas until tender, 5 to 7 minutes for frozen or shelled peas; 2 minutes for small garden peas. Immediately before serving, stir the peas into the potatoes with some of the chopped mint. Place on a serving plate and sprinkle remaining mint on top. Serve room temperature. 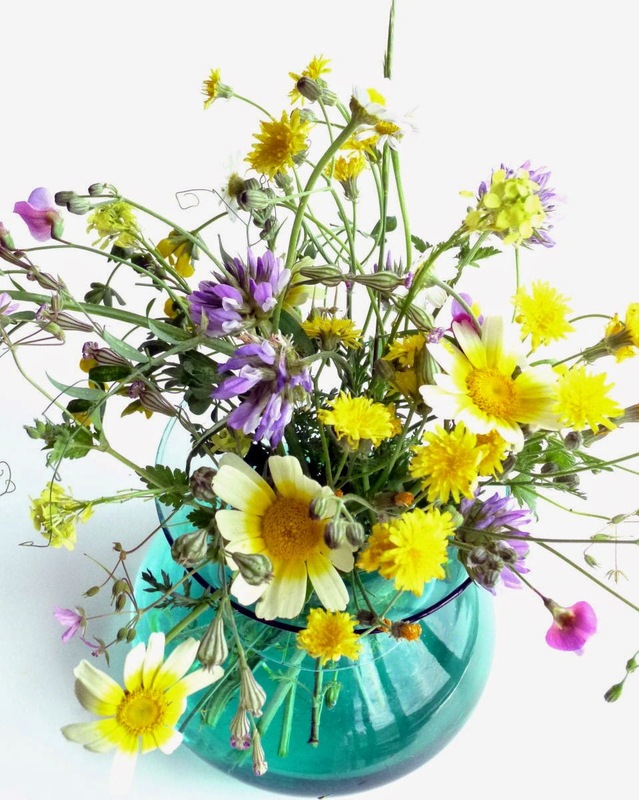 Wildflowers, garden peas, April showers. Must be springtime. 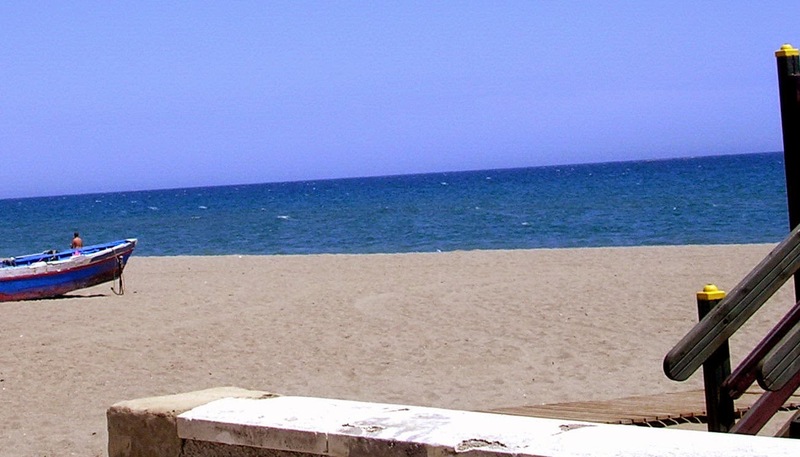 The traditional cooking of Marbella reflects its geography—fishing port, olive groves, irrigated farmland and citrus orchards, upland game reserve. 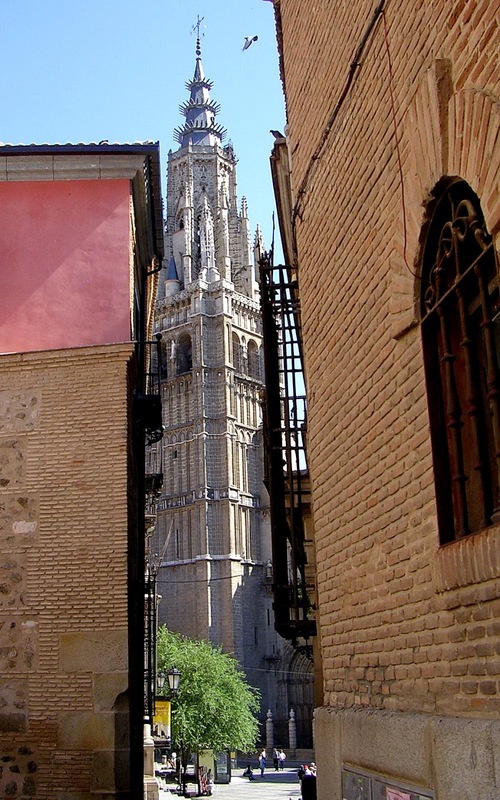 It also has cocina de vanguadia, avant-garde cuisine, such as that presented by two-Michelin-star chef Dani García at his eponymous restaurant at the Puente Romano Beach Resort. Chef Dani makes a cherry gazpacho with cream cheese, anchovies and pistachios that is a tongue-in-cheek take on traditional food and, at the same time, supremely delicious. 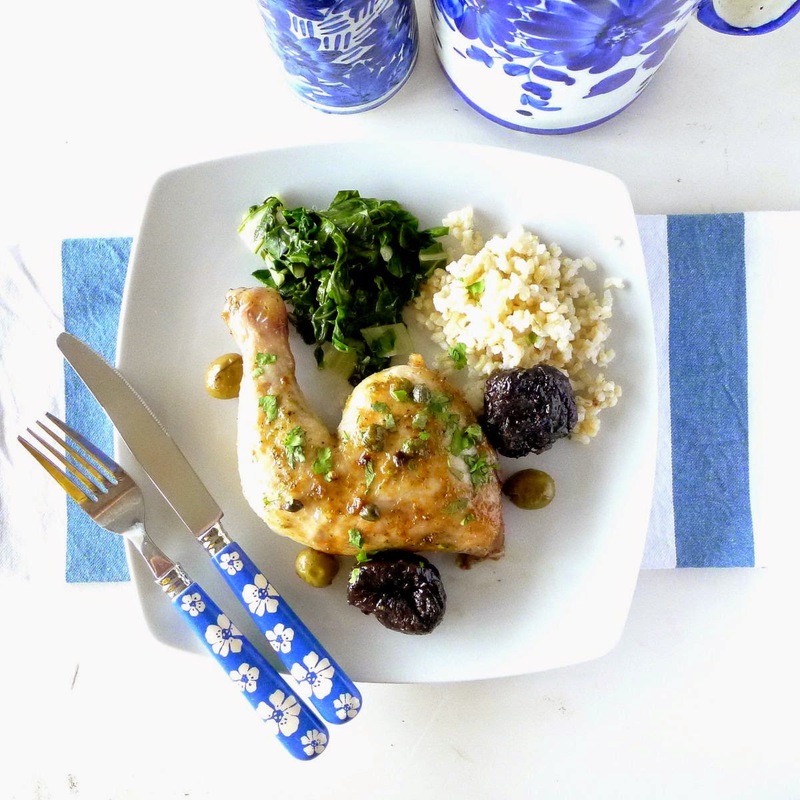 But nowhere in Marbella is there anything quite like Chicken Marbella, a recipe that appears in a classic American cookbook, The Silver Palate Cookbook by Julee Rosso and Sheila Lukins ((Workman Publishing; 1979). Because the recipe is so un-Spanish, in spite of its name, I’ve always skipped over it. 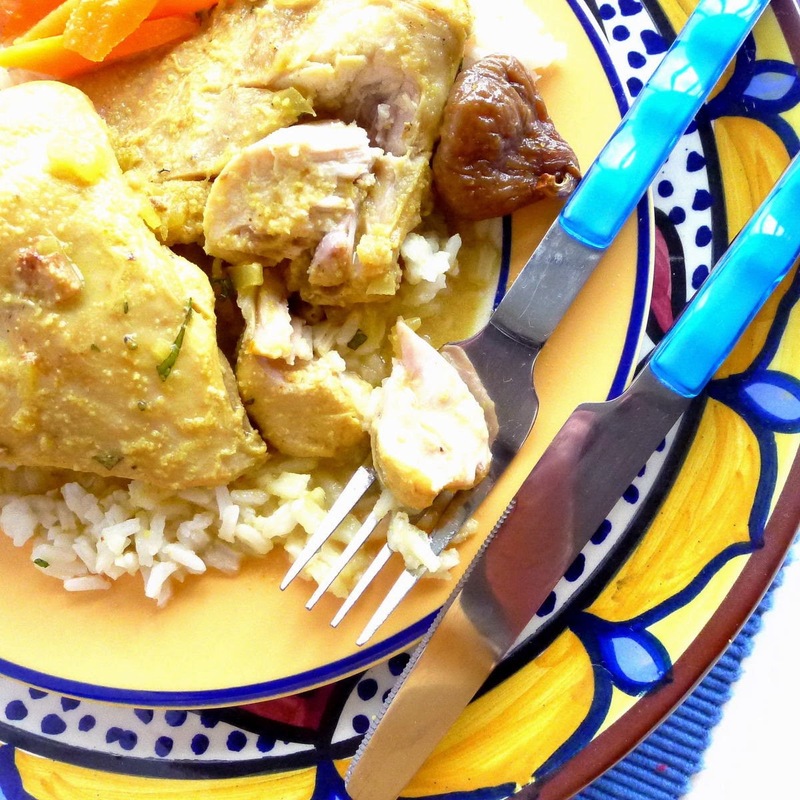 But, recently, I read an article in The Tablet (an online daily magazine of Jewish news and culture) proclaiming Chicken Marbella as one of “our favorite recipes for the Passover seder.” (The Passover holiday ends today.) I decided it was time to take another look at that recipe. The brilliant bit about the recipe is its ease of preparation. It calls for four chickens, meant to feed a crowd. You put the quartered chickens in a marinade, overnight or longer, then put them in roasting pans, add prunes, olives and wine and bake until tender and golden. 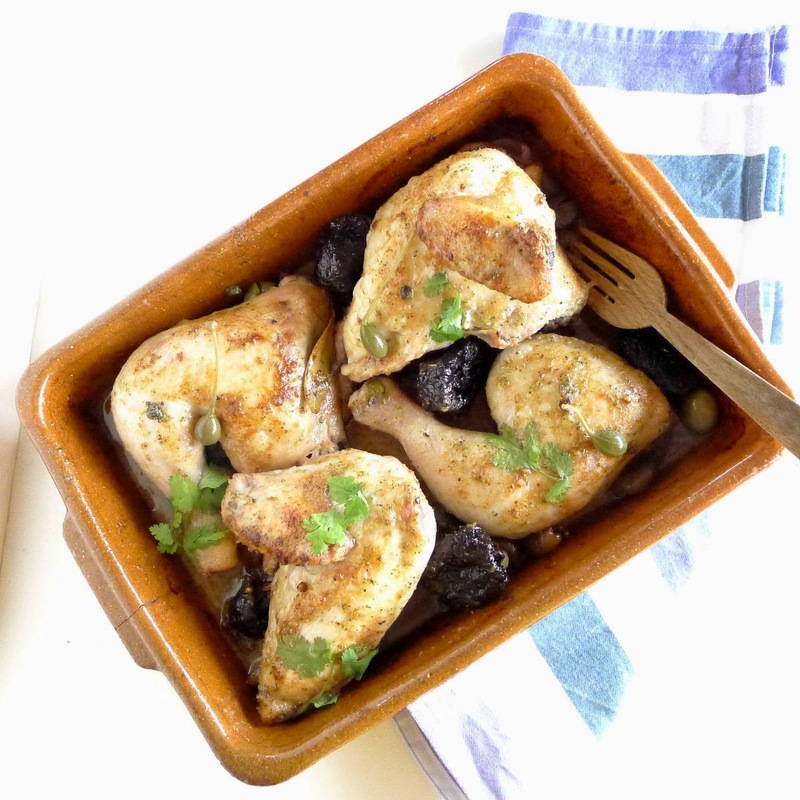 Marinated chicken bakes with prunes, olives and capers. The marinade calls for vinegar and oregano. 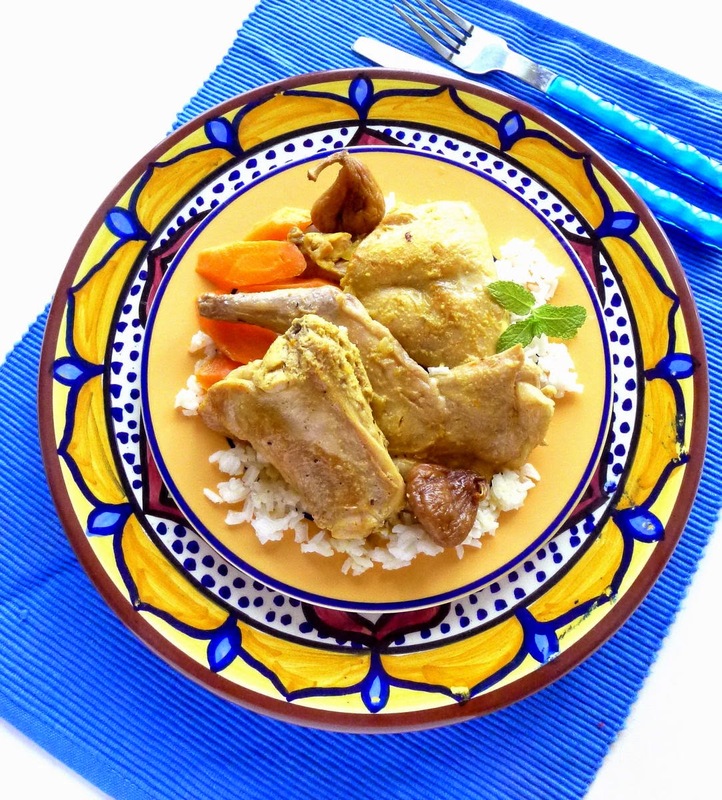 That, indeed, is a typical Spanish adobo, commonly used with fish, pork, or poultry. Then, you add prunes, olives and capers. 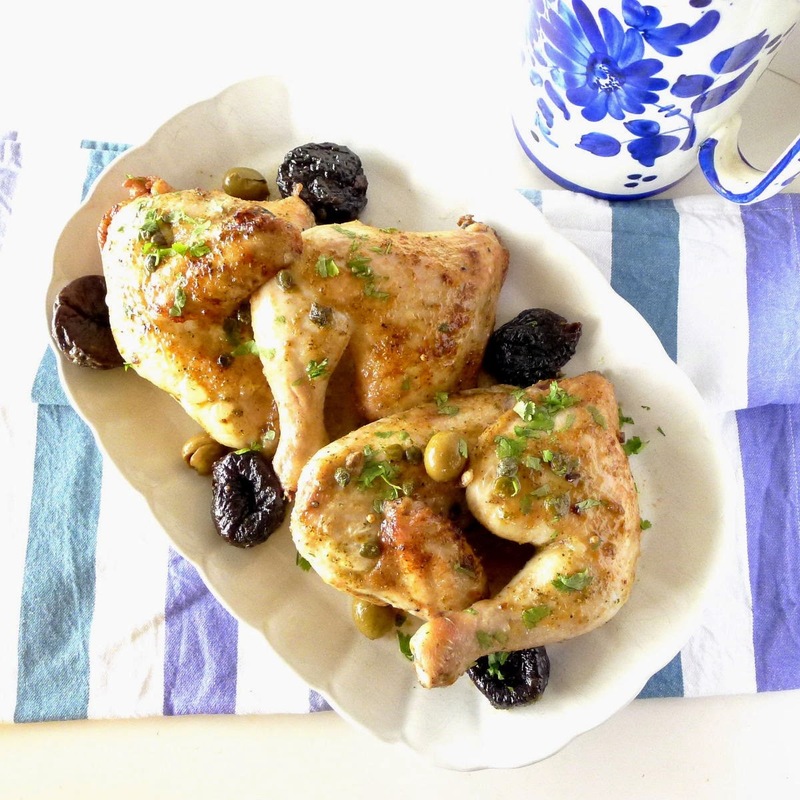 Spanish cooking occasionally combines meat and poultry with fruit (I have a Moorish-inflected recipe for lamb with prunes) and also with olives (chicken or duck). But, both? Well, I’ll give it a try. Then, you place the chicken pieces in baking pans, spread brown sugar over them and add white wine. Sugar! 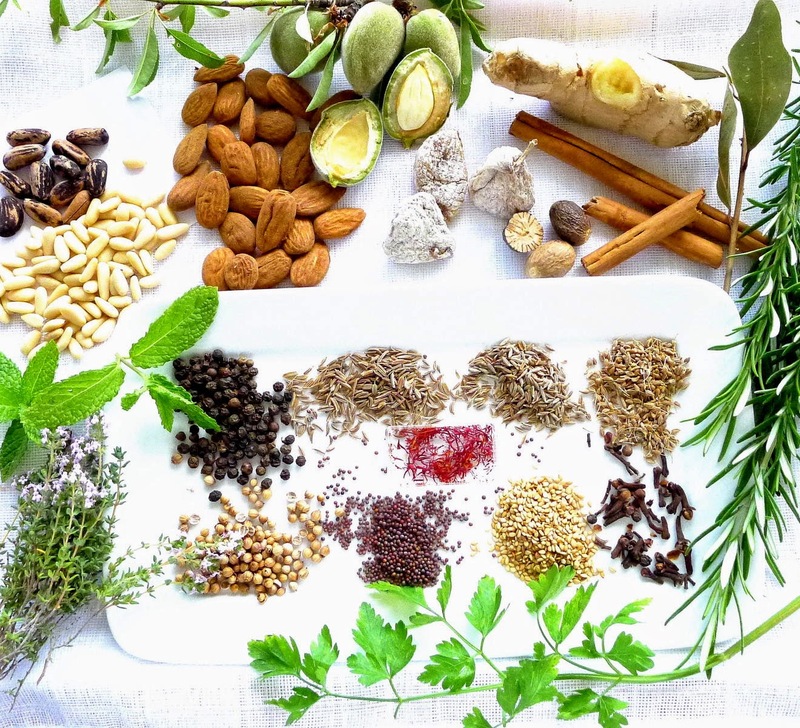 An earlier article in The Tablet included an interview with Julee Rosso, one of the authors of The Silver Palate Cookbook, who said their recipe was inspired by food they encountered while travelling in Spain and Morocco. The “prunes were very much Marrakech tagines; the green olives were Marbella, Spain.” That sounds about right. But, the sugar is pure American! Maybe that’s why it’s such a popular dish. But, not in my kitchen! No sugar, no way. 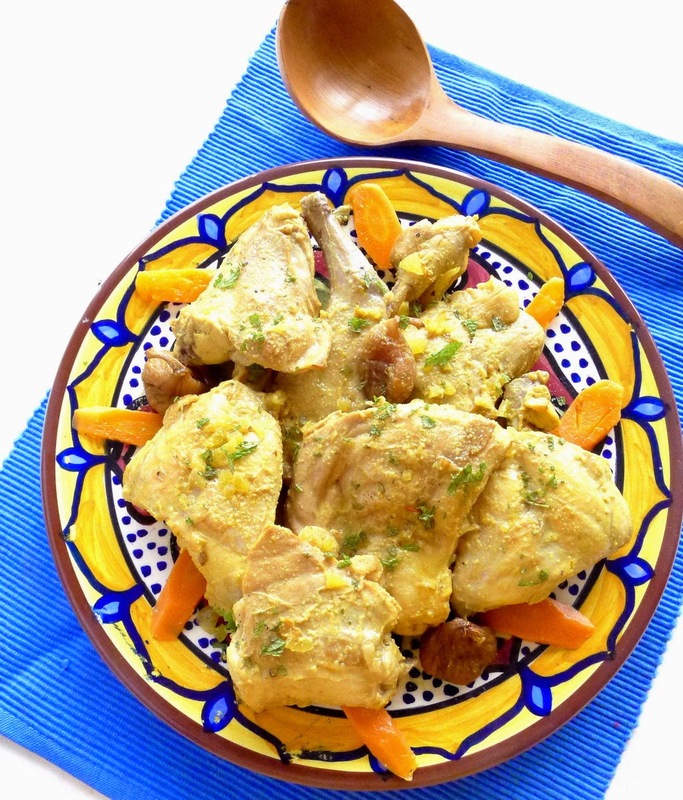 Here is my interpretation of the classic Chicken Marbella. I made it with one chicken, to serve four. I’ve eliminated the sugar totally. If you like the sweetness, I suggest using sweet wine such as muscatel, PX or sweet Sherry. I used Sherry vinegar instead of red wine vinegar in the marinade and dry Sherry instead of white wine as called for in the original recipe. I loved the sweet jammy baked prunes with the briny olives and capers. You can use all legs and thighs instead of a whole quartered chicken. Place the chicken quarters in a non-reactive container (glass or ceramic). In a blender or mini food processor, combine the salt, pepper, oregano, vinegar, oil and brine. Spread half of it over the chicken. Turn the chicken pieces and spread remaining marinade on the chicken. Cover and marinate, refrigerated, at least 12 hours or up to 2 days. Place the chicken pieces in a roasting pan. Scrape all the marinade over them. Tuck the prunes around the chicken. Add the capers, olives, bay leaves and coriander seeds. Pour the Sherry around the chicken. Bake the chicken, uncovered, basting with pan juices every 15 minutes, until chicken is tender and lightly browned on top, about 60 minutes. 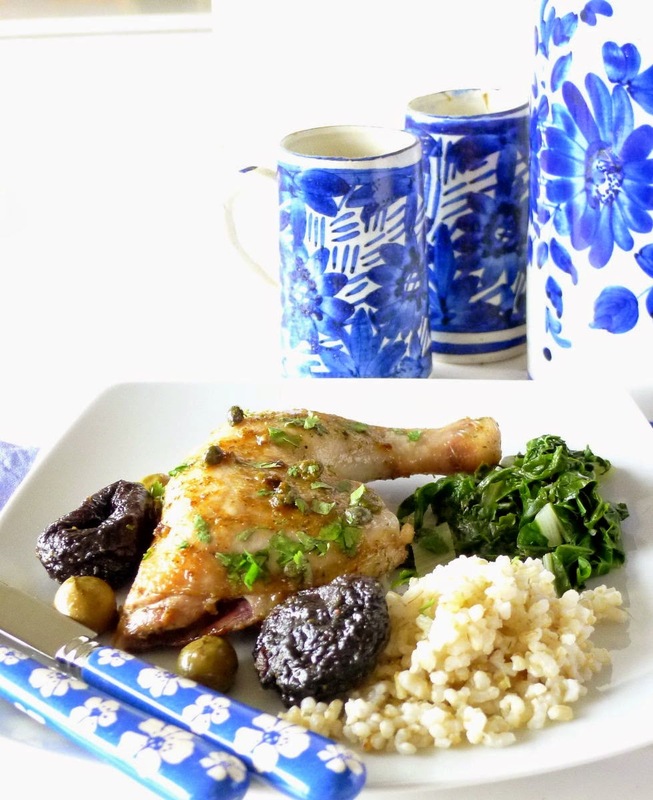 Transfer the chicken, prunes and olives to a serving platter. Discard the bay leaves and pour the pan juices over the chicken. Scatter chopped parsley or cilantro on top. 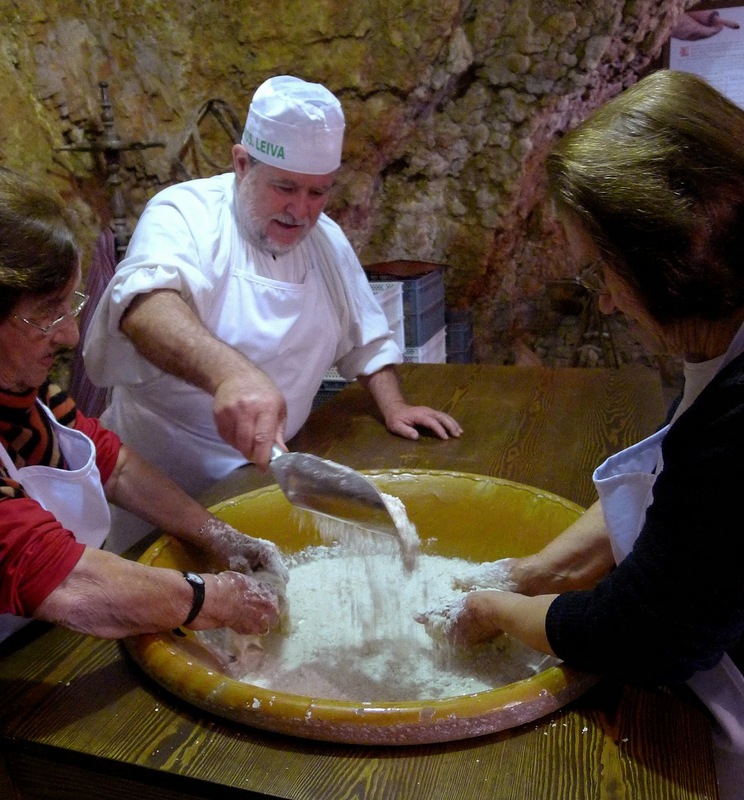 Adding flour to the levadura madre, the starter dough for making bread. 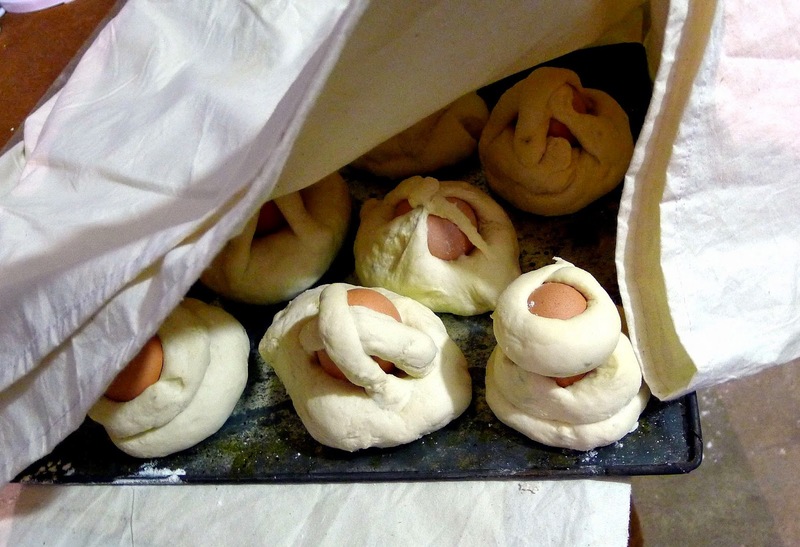 We are preparing dough for hornazos, bread rolls with eggs, a traditional Easter snack. 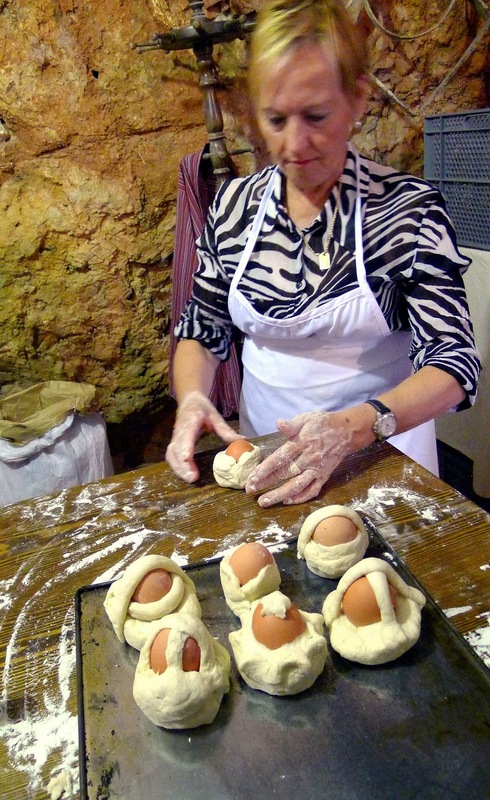 Con las manos en la masa-- Hands kneading dough to make traditional Easter breads, hornazos. 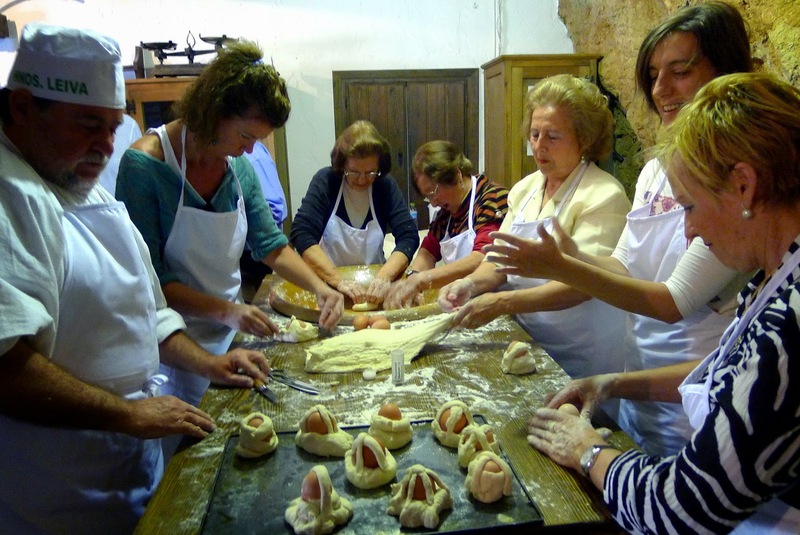 Once the dough is kneaded until it is no longer sticky, Antonio Garcia shows the particpants how to pinch off pieces and shape them into small balls to enclose a raw egg. Each person gets to shape the hornazos. Most are simple little rolls; others are boats, baskets, turtles. 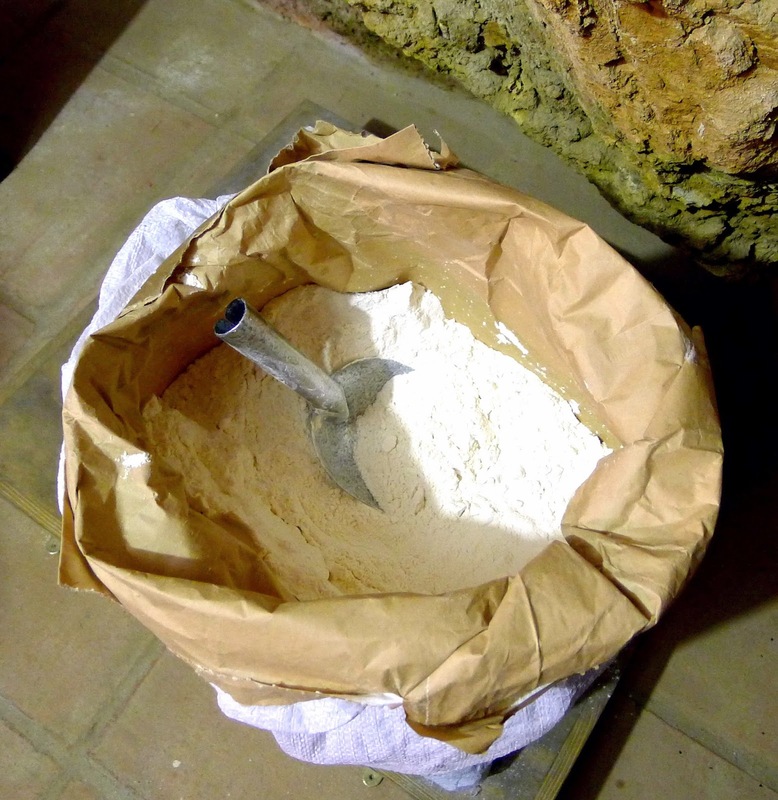 In my village, the hornozos are made of basic bread dough with a little matalahúga, aniseed. In other towns, they may have oil or lard, sugar or honey added. 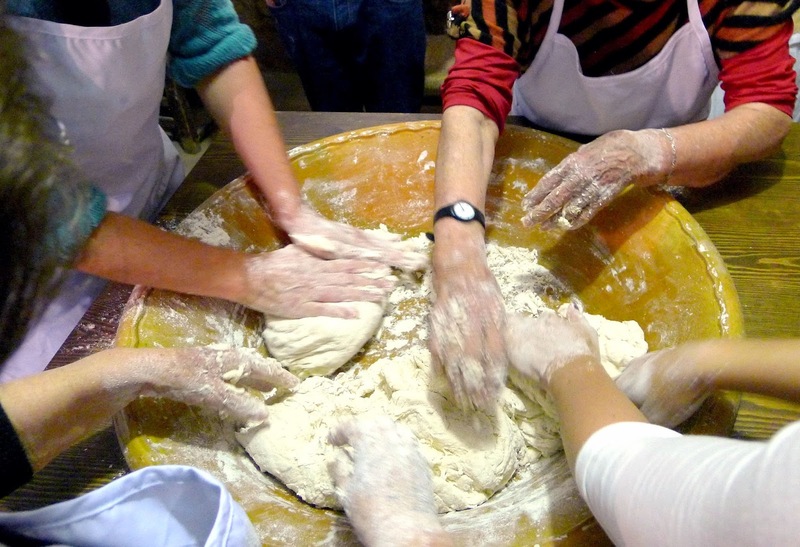 Many hands roll out the dough. The rolls are covered and left in a warm place to rise. Here, an electric heater underneath is the heat source. 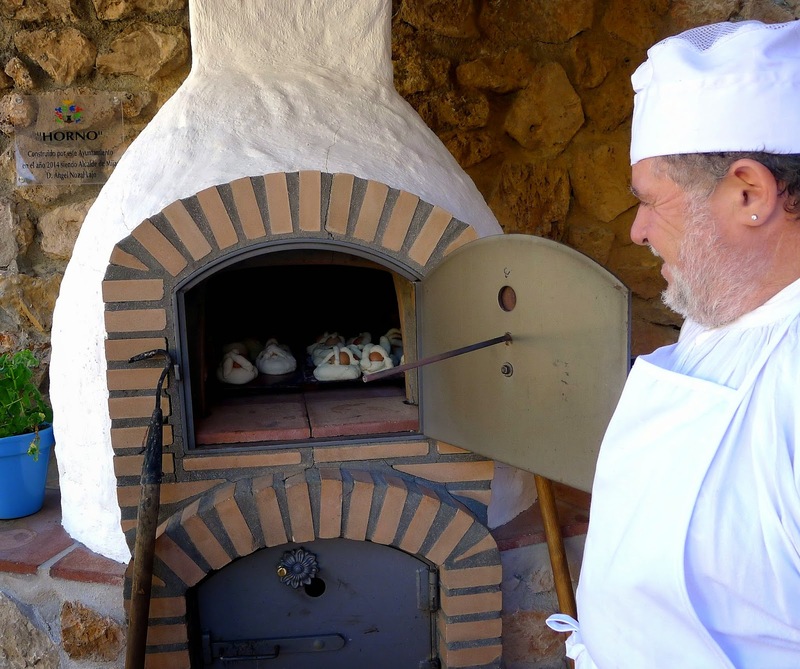 Antonio puts the first tray of hornazos into the wood-fired oven. 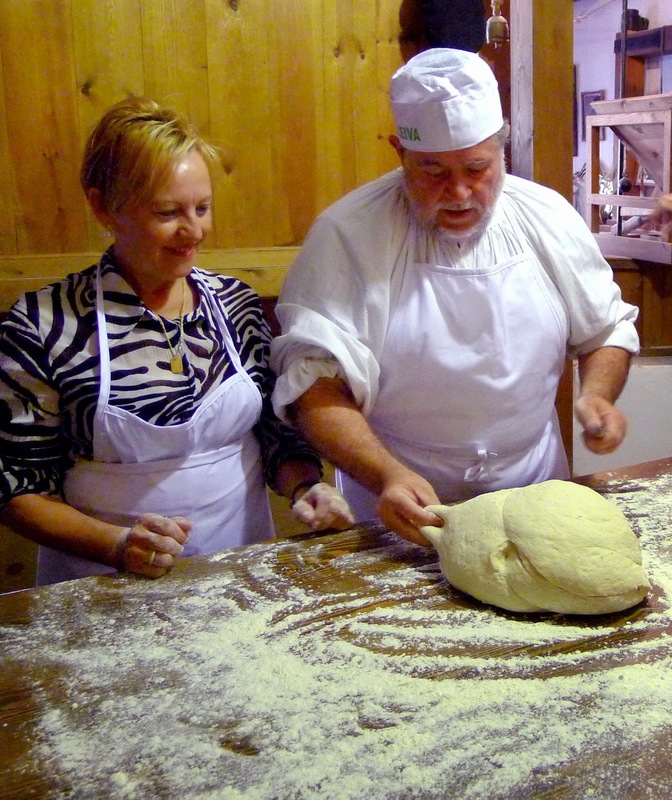 This oven is similar to the traditional bread ovens. 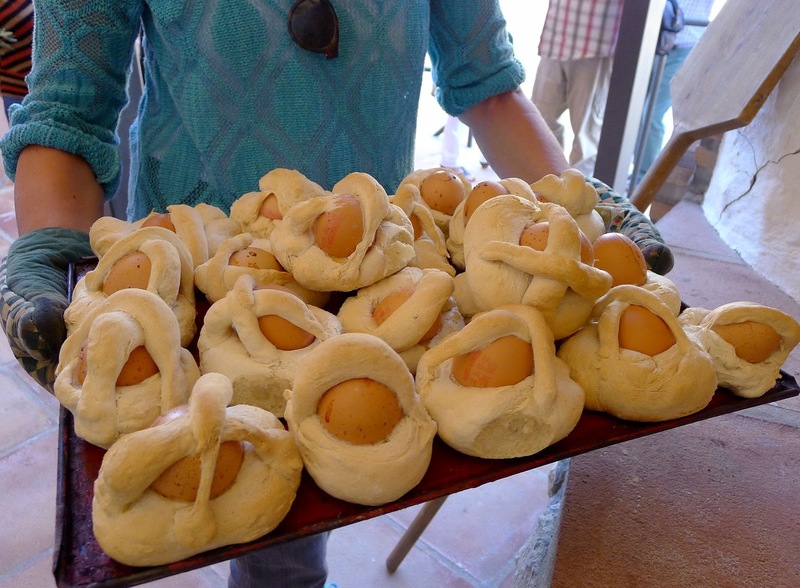 Fresh out of the oven--a tray of hornazos, bread rolls with eggs. 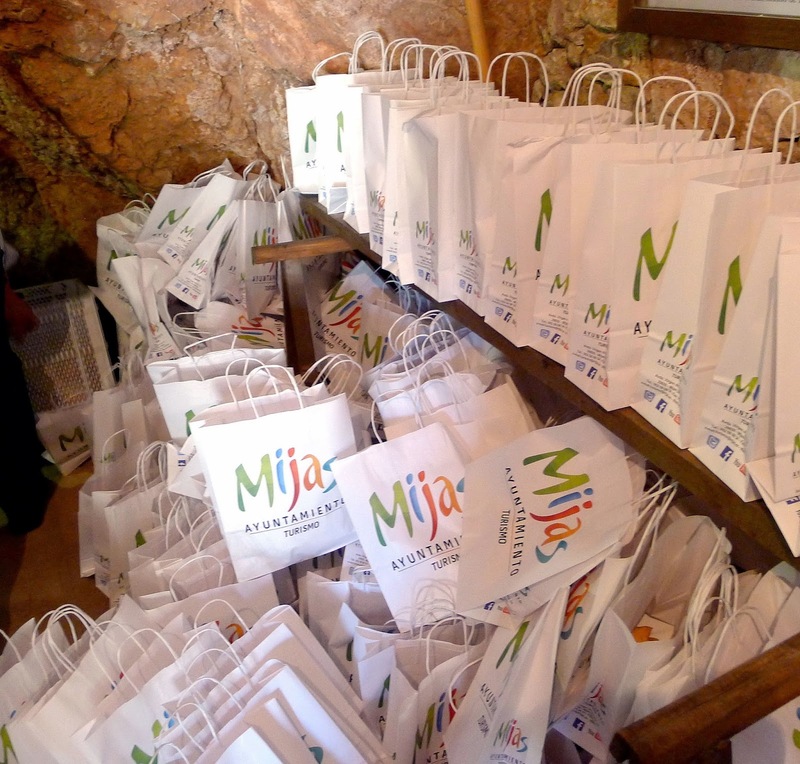 The Mijas village tourism department gives away bags of hornazos to visitors on Palm Sunday and Easter Sunday. Grist for the political mill. 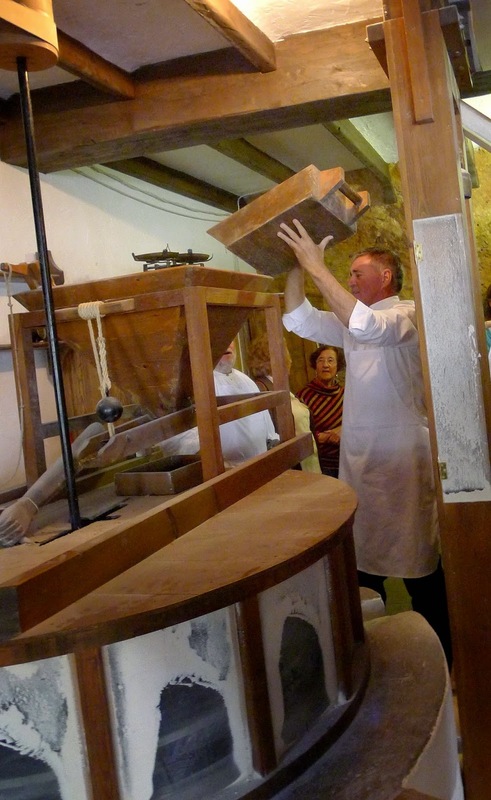 The current mayor of Mijas, Angel Nozal (Partido Popular), who is running for re-election next month, dumps wheat in the mill for grinding and gets his manos en la masa as well. 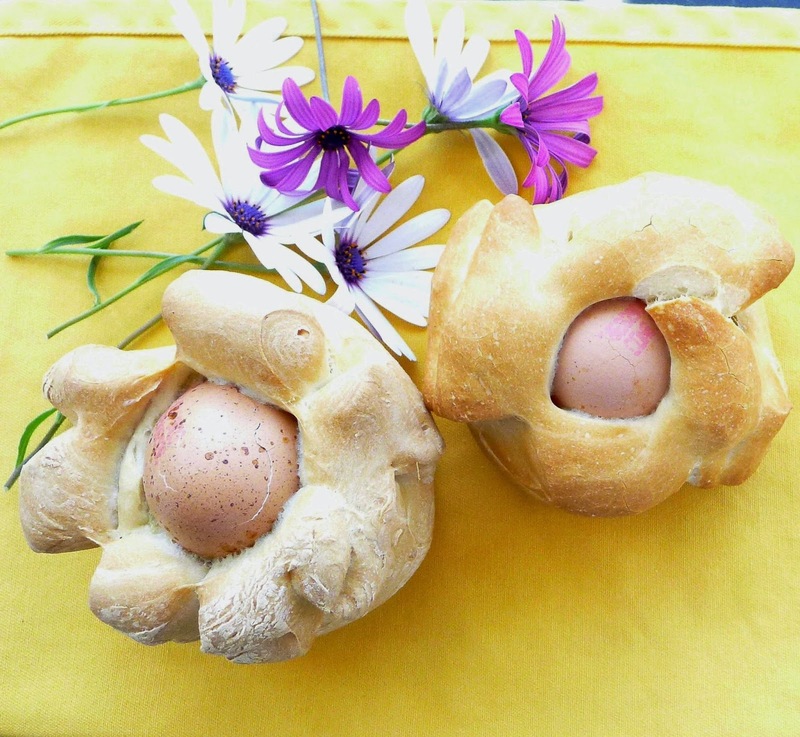 Hornazos, a typical Easter bread, with egg baked in the dough.